Granja La Paz is a project born in 1998 in Ibiza in collaboration with small agricultural companies of organic production, which has combined the technological capabilities of its entrepreneurs in order to produce products of high gastronomic value. The commitment made by our team is based on a commitment to innovation and quality that has materialized in its first family of products. 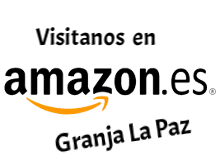 The development of Granja La Paz products is based on a strong interaction with all the factors involved in the production, marketing and use of the product. Our philosophy is to be transparent and faithful to our customers, so we always indicate the origin of our gourmet products. In all our farms we use agricultural techniques that absolutely exclude the use of synthetic chemicals such as fertilizers, pesticides, antibiotics, etc., with the aim of preserving the environment, increasing soil fertility and providing food with all its natural properties. We own estates (own and associates) in Ibiza, Jaen and Caceres where our star products of Granja LaPaz are made. We are the only intermediary between Nature and the product elaborated, ready to consume. We use traditional picking and picking methods. We pack using the most modern control technology, food safety and hygiene. We maintain from the beginning to end the properties of the natural product. Today, we take advantage of the use of new technologies to sell and publicize our excellent products. Our history guarantees us ... since 1998 ! !